Individual eyelashes applied to the natural lash using medical grade glue to give you longer, fuller and thicker eyelashes. These individually bonded lashes will enhance your eyes, making your lashes darker, fuller and more noticiable. 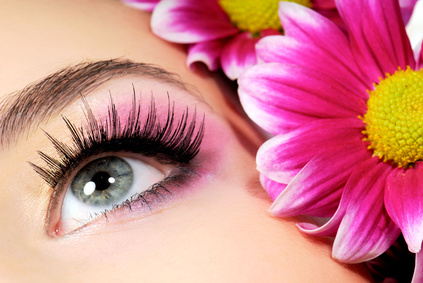 As they are profesionally applied and when correct after care is followed, they do not damage the natural lash which can be caused when using traditional eyelash extensions. A range or lenghths, thickness, colour and curl are avalable so if you are looking for the natural look, glam look or fancy a flash of colour it is achievable. With regular maintenance these extensions can last upto 12 weeks. Maintenance is recommended every 2 weeks to ensure that your lashes stay looking fabulous !!! Individual lashes coated in glitter that will wear off over 2-3 days, leaving you with black extensions. Perfect for parties, a night out or if you just want a bit of bling !!! If you rebook you will be offered a 10% customer loyalty discount. This treatment is not yet widely available, so book now to avoid disappointment. In a recent survey on Beauty Finder Myscara was voted one of the best new beauty treatments for 2011 by Beauty Finder members.. The MYscara product is a safe and eye friendly lash coating. It is applied professionally and cannot be purchased for home use. It has a similar effect to traditional mascara but lasts weeks. It won’t smudge or budge no matter how much you get them wet. It is aimed at natural lashes but can also be used with semi permanent lashes if applied during the procedure. The treatment takes around 30 minutes. You can have 1 – 2 coats for a natural look or more coats for a thicker more dramatic look. Recommended treatment price is £45.00.